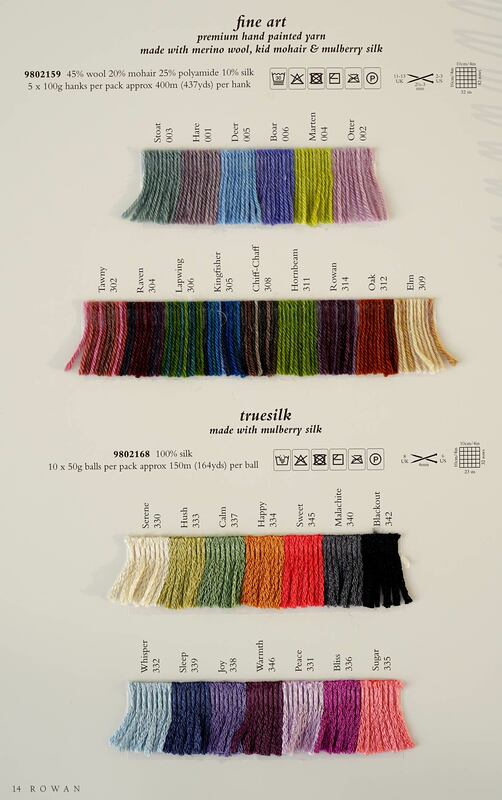 Yarn Type SALE 20% OFF! A blend of fibre and colour. Designed for socks, shawls and other accessories, it is made with merino wool, kid mohair, mulberry silk and polyamide to make it suitable and durable for all projects. Wool: 45%, Mohair: 20%, Silk: 10%, Polyamide: 25%. Hand Wash warm. 8 designs and accessories for women introducing new subtle shades in Fine Art and Fine Lace. Scarves and shawls from a simple reversible loop scarf and cowl to an intricate triangular shawl. Whether its the asymmetric Rakau with a textured edging, Kohatu with its short row shaped shells or the quick to knit lace Merkur scarf we think there is a project to capture everyones interest. The designs would suit the experienced knitter. Contains a selection of 10 beautiful designs featuring textured and lace pieces using crochet and knit stitches using Rowan Fine Art. Designed by Marie Wallin and Lisa Richardson the collection includes a selection of scarves, wraps, wrist warmers and capes using the new blended shades of Fine Art. Knit this slip stitch mini poncho, designed by Lisa Richardson using the divine yarn Fine Art (merino wool, kid mohair and mulberry silk). With a gorgeous slip stitch pattern and cosy collar, this knitting pattern is suitable for the intermediate knitter. Originally featured in the Fine Art Accessories Collection brochure, this pattern in now available to download for free. Knit this ladies boat neck sweater from Rowan Knitting & Crochet Magazine 56 as an exclusive free download, a design by Grace Melville using the stunning combination of Mohair Haze (super kid mohair and extra fine merino wool) and Fine Art (merino wool, kid mohair and silk.) This pretty sweater has a geometric mosaic design knitted using the fairisle technique and contrasting stripes. This free pattern PDF has also been translated into French, German & Dutch. This collection of 14 designs introduces the first ever sock yarn to the Rowan range, Rowan Fine Art. Featuring 10 designs for socks of every length and 4 accessory designs, this brochure also includes a useful 'how to knit socks' guide. Knit this stunning lace scarf, a free download for yarn Fine Art (merino wool, kid mohair and silk). A design by Lisa Richardson, this accessory piece is a sophisticated and stylish design showing off the beauty of the yarn perfectly. This knitting pattern is suitable for the beginner knitter.